On the right of this image is our home galaxy, the Milky Way. On the left, the wing of a Boeing 747. How, pray tell, does one acquire such a photograph? Astrophotographer Alex Merga captured the image June 7th, while aboard a red-eye flight from New York to London. The shot was taken from around 37,000 feet above the Atlantic Ocean. At that altitude, Merga tells io9, conditions are perfect for astrophotography. The sky is clear and light pollution is at a minimum. In fact, he says the challenges he faced were mostly technical. How does one take a long-exposure photograph from a plane soaring through the air at 600 miles per hour? "The only solution," he tells us, "was to make each exposure as short as possible while still capturing enough light." To do so, he set his Canon 28mm f1.8 lens wide open, and his Canon 450D to 1600 ISO, the maximum for his camera. He shot a total of 93 pictures, each with an exposure time of 30 seconds or less. Further measures were taken to improve his chances of capturing a clear shot. To keep things stable, he wedged his tripod – a flexible Gorillapod – between his armrest and the plane's fuselage. "I covered myself with a blanket to block all reflections coming from inside [the plane]." When all was said and done, Merga got one good shot from the lot of them: the 10-second exposure pictured above. Merga tells io9 he first had the idea for this shot last November while aboard a 767. "I saw the Milky Way from the window, and it looked great, even in winter," he tells io9. (The brightest region of the Milky Way faces towards us in the summer months. In the winter, the galaxy appears dim by comparison.) What's more, he says, conditions at the time were not ideal; the plane was full, and he didn't want to disturb anyone with his tripod-wedging and blanket-covering. 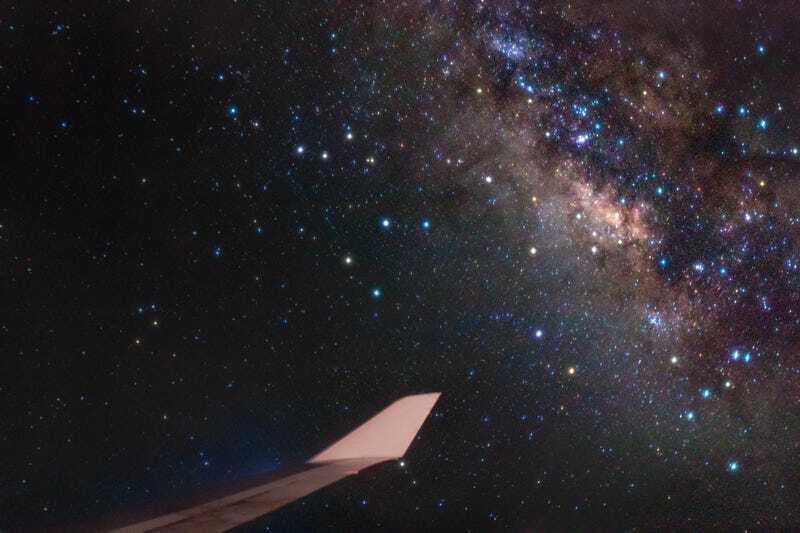 This time, however, Merga says his plane was almost empty, "and with the summer part of the Milky Way in view, the conditions were perfect and I wanted to try, though I was not sure of the feasibility of photos."